Long, dark, slender, slightly twisted 'single bush' leaves producing a lovely, popular tea with the aroma of honey and fresh peaches. This ‘single bush’ oolong was picked from a rare tea tree on Phoenix mountain, legendary playground of demigods and fairies. It is one of only 3,000 trees directly descended from one of the famous 18 tea bushes that have existed for 900 years in a unique, beautiful tea grove. Each of the 18 bushes produces tea with distinct flavour profile. The profile of Honey Orchid includes a reddish-golden liquor, sweet and flavourful, with a subtle floral fragrance and lingering aroma suggestive of honey and fresh peaches. The particular qualities of each Phoenix ‘single bush’ tea depend also on the precise conditions of picking and processing. 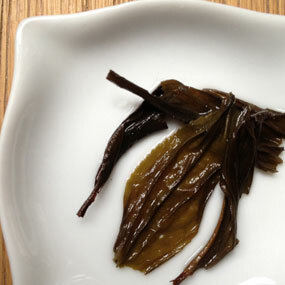 Individual budsets are plucked when the weather is neither too wet nor too bright, then dried in the sun, hand-massaged and processed for 10 continuous hours overnight, and in due course the semi-oxidised, lightly roasted leaves acquire their very distinctive, slender, slightly twisted and shiny appearance.